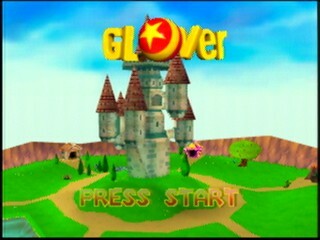 Released in 1998 by Interactive Studios, Glover has one of the more ridiculous plots you'll find in a platformer of the era. A wizard caused an explosion that turned him to stone and scattered seven magical crystals across the land. Without those crystals, the wizard and his kingdom are doomed. Fortunately, one of the wizard's gloves is on the case, taking it upon itself to gather them. Fortunately they're masquerading as rubber balls, so he can roll them back home and save the day, as long as the evil glove doesn't foil his plans. Definitely falls into the realm of things you wonder how they came up with. I'm glad to finally have a run that I can say i'm satisfied with. I'm also glad to be able to replace Crankeey's run with something that has all the new strategies, and is rather clean. Pyrius: For doing a bunch of glover emulator testing before I even ran the game. Chrisvoodle: For giving me competition, and motivating me to not do baby strats. All the other glover oldbois that have disappeared (Heeheex2, Crankeey, Stri, etc. ): Found quite a bit of the routes used. This run is for you fallen heroes...... . .. .
People who supported me when streaming attempts: because they made the resets a bit more tolerable. Me: For finding Carnival 1 + Boss strategies that are epic. So I'm gonna keep this short since noone likes reading these anyways. -L-Cancelling: By tapping the L-Button repeatedly, I am able to gain great speed. For whatever reason changing your stance on the ball will speed you up a lot. I also won't die when I fall from great heights with it. -L-Sprinting: When you hold a diagonal and go from holding to standing on your ball, you will move a lot faster than normal. This is a variation on L-Cancelling and although it isn't faster I use it frequently because it's more controllable. -B-Ball Cancelling: By tapping B twice when in midair, you will go from a dribble to a holding animation. This lets me get more distance and maintain height. -BZA: By holding my ball in midair and cancelling it with Z I am able to do a ground input in midair for a short period of time. During this short period of time if I tap A my ball will do a high throw instead of the normal low one. This lets me get my ball to high places it normally is not able to. -B-Cancelling: By holding my ball so I'm in the throw animation and cancelling it, I'm able to avoid dying from great heights. This is usually done by accident when I fail a B-Ball Cancel lol. -Cutscene skips: Camera take priority over the cutscenes, so by mashing C-Up when I hit a switch I can skip the cutscene completely. -A-Bounce: So by tapping A I can throw my ball high up vertically. If I run into it as it touches the ground I can use the extra height from the bounce to get over the fence in Carnival 2. Only really applicable in Carnival 2, sadly. -Ship Clip: The Pirates Boss end target is located inside the chest right behind the monkey. You can clip through a seam and completely skip the monkey fight, this run gets it first try which is pretty crazy since there's no setup and the trick is somewhat random. Atlantis: Close to perfect. Atlantis Boss went a bit rough, but it was only a second lost to luck. Carnival: Missed a cycle because of Dennis in Carnival 3, so about 4-5 seconds here. The rest of my Carnival was pretty much flawless though, so expecting this timesave is asking a bit much. Pirates: Pirates 3 had a rough start, so 4-5~ seconds here. Otherwise, the world went perfectly. Fear: Fear 2 went a bit poorly, and my Fear 3 was a bit slow going into the teleporter. Around 8~ seconds. Space: Space 3 has one death, which cost 10 seconds. I also missed quick kill on Space Boss which means another 10 seconds lost. So realistically I could probably save 20 seconds. This is the only real timeloss in the whole run, but after getting this far on this pace I was fine with this. Overall, I'm very happy with it. This game is very unforgiving and the controls are rather loose. I'm fully aware this is not unbeatable, but it is still fairly solid and I personally won't be coming back to this anytime soon. Thanks for reading this if you did, and this probably doesn't make much grammatical sense since i'm tired as heck woo wee.